I apologize for being a couple of days late with this news, but “Arrow” season four is hitting Blu-ray this summer on August 30th. It’s an earlier release than past seasons, but it’s definitely a good thing, as those who missed the season can get caught up before season five premieres. The Series Continues with New Villains, New Heroes, and New Challenges! Contains All Action-Packed Episodes from the Fourth Season, Plus All-New Featurettes, The 2015 Comic-Con Panel, Deleted Scenes and a Gag Reel! BURBANK, CA (May 31, 2016) – Just in time for Arrow’s fifth season on The CW, viewers can catch up with the thrilling series as Warner Bros. Home Entertainment releases Arrow: The Complete Fourth Season on Blu-rayTM including Digital HD and DVD on August 30, 2016. Averaging 4 million viewers weekly for each original episode, Arrow is The CW’s #3 show among Total Viewers, behind The Flash and DC’s Legends of Tomorrow, and the #2 series on The CW amongst Adults 18-34. * The release contains all 23 exhilarating episodes from the fourth season, and The Flash crossover episode; plus over an hour and a half of extra content, including the 2015 Comic-Con Panel, never-before-seen featurettes, deleted scenes, and a gag reel. 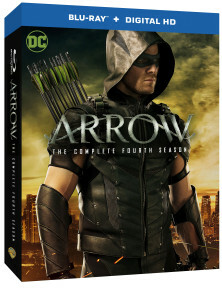 Arrow: The Complete Fourth Season is priced to own at $49.99 SRP for the DVD and $54.97 SRP for the Blu-ray including Digital HD. Are you going to be picking Season four on Blu-ray?